This is one of the most famous songs in the world, and also one of the most difficult to sing. The playing of it, whilst not requiring a virtuoso technique, calls for great control of colour and touch, as well as evenness of rhythm. As with Lachen und Weinen, composed at the same time, the song has become such a classic that it is easy to forget the oriental inspiration behind the poem, something written into the music by a composer supremely sensitive to literary background. Du bist die Ruh has such inner poise that it suggests a transcendental religious experience unfolding in the solemn, meditative time-scale that one associates with the rituals of the east. The setting is extremely moving, but it sometimes seems not to move at all: this tempo (a slow 3/8) makes something deliberately repetitive, even monotonous, of the music—a chant or mantra, a litany of patience and humility which hymns long-lasting love and the steady-breathed span of an enduring relationship. Thus the text combines two of the poet’s preoccupations, for Rückert was not only an expert on eastern literature, he was an ardent spokesman for marriage and family life. This is what appealed in Rückert’s work to Schumann as he dreamed of his bride: Du meine Seele, du mein Herz became the dedicatory song of Myrthen, and both the Liebesfrühling and Minnespiel cycles burnished the image of Robert and Clara as an ideal couple. What Schumann attained in his private life was never to be Schubert’s lot, but in this heavenly music we glimpse the extent of the composer’s own longing for emotional security, for the rapture and safety of a committed relationship. Du bist die Ruh is as much a prayer as a lovesong, but there is nothing in the music for this madonna which suggests the Catholic faith of Schubert’s fathers. A love of this depth is something distant and mystical in the composer’s eyes, something not to be found in Vienna, and the faraway Orient is the ideal locale for such a fantasy. The poem unleashes all Schubert’s tenderness, a powerful gentleness which marries sensuality and idealism in a way that recalls the sublime coda of the first of the two Suleika songs, a miracle of eroticism married to idealism. On a less exalted plane perhaps, Geheimes, Versunken, and the part-solo, part-choral Im Gegenwärtigen Vergangenes also come to mind as eastern evocations, all the more remarkable for being based on imagination rather than experience. Sadly, the composer’s own recent experiences of love had brought him anything but peace and reassurance. The extended seven-bar Vorspiel is an extraordinary achievement. The two hands of the pianist embark on their pilgrimage as they meet in the middle of the keyboard, the left marking out a gently pulsating rhythm in quavers, the right in evenly spaced semiquavers which oscillate back and forth (they must be handled with infinite care by the pianist) as they trace the ghost of a melody. This music will soon serve as the basis of the song’s accompaniment, but the slow-moving harmony suggests a gradually opening flower, or perhaps a calm vista which spreads itself before our gaze. The hands gradually move further apart; after three bars, two-part writing blossoms into three parts, and then five; the rocking semiquavers move to the left hand, and longer note-values transfer to the right; dotted crotchets seem to aspire heavenward as a sequence of lofty suspensions leads to a return to the E flat major (in the original key) of the song’s opening. In these bars nothing much has seemed to happen on paper, and yet, in terms of sound and mood, and in typically Schubertian fashion, the composer has conjured something visionary and sacred. The poem is in five strophes and the song grows like an exotic plant, reproducing first its smallest cells which then become incorporated into an ever larger organism—a musical version of Goethe’s Die Metamorphose des Pflanzen. Thus the music for the first two lines of the poem is almost identical (a single note is changed) to that of the third and fourth, and the same applies to the different music of the next verse. But it is these two strophes, taken together, which make the first complete musical verse of the song. This larger structure is in turn repeated, with its smaller internal repetitions, to make a second musical verse. It is this organic architecture which makes everything in this music sound inevitable and pre-ordained. Four strophes are used to make two more-or-less identical musical verses, and the fifth is repeated to give the impression of a text of even-numbered strophes. This ensures a perfectly balanced shape, a symmetry based on a masterly use of repetition which marks out Du bist die Ruh as a companion piece to Lachen und Weinen, an impression strengthened by their shared use of the ‘oriental’ flattened sixth. The melodic shapes of both songs are extremely simple, yet instantly memorable: in Du bist die Ruh an ascent of a tone, a stretch of a third up to E flat, a dip to the leading note and a beatific return to the tonic. As in Lachen und Weinen, the first four bars of the vocal line are instantly repeated. In this case, the repetition of the same music for the poem’s third and fourth line (‘Die Sehnsucht du und was sie stillt’) seems an apt metaphor for constancy. The composite mood of the three key words ‘Ruh’, ‘Friede’ and ‘mild’ is perfectly captured. Then a trace of unstilled ‘Sehnsucht’ is suggested by the diminished chord harmony under ‘Ich weihe dir’, a new fragment of melody this, where the lingering passing note on the word ‘dir’ is tenderness itself. The phrase for ‘Voll Lust und Schmerz’, a miniature echo of the idea of unity in contrast in Lachen und Weinen, is once again a mixture of diminished and major key harmonies. The persistent movement of slowly flowing semiquavers is sometimes broken by dotted rhythms in the vocal line (at ‘und Schmerz’ for example), a bel canto device which is here harnessed to suggest something far more restrained than an Italianate sob: a voice which momentarily hesitates, lingering on a note as if suddenly caught by emotion. The third and fourth lines of the poem’s first strophe have been musical repeats of the first two, and there is a similar pattern of internal repetition in the second strophe. Although at first glance the music for ‘Ich weihe dir voll Lust und Schmerz’ seems identical to that for ‘Zur Wohnung hier mein Aug’ und Herz’, there is a crucial difference. ‘Voll’ is sung on an A natural as part of a diminished chord, but the corresponding moment in the next phrase (‘Mein Aug’ und Herz’) is harmonised by the first inversion of A flat major. This is followed by the first inversion of E flat, a plagal progression which adds a sacred tone to the idea of the lover’s consecration of his eyes and heart. This resolution, the difference between that slightly unsettled A natural and the consoling A flat a semitone lower, is an analogue for the solving of problems, the allaying of fears. The seal of immortality is placed on the musical phrase by an extra tag of two bars where ‘Mein Aug’ und Herz’ is repeated like a murmured blessing, a marvellous touch; this begins a third lower (the music’s tessitura sinks as if peacefully reassured) and leads back to the tonic key. The drooping intervals we hear both times on the word ‘Herz’ are like a bow, indicative of the lover’s self-abasement in the presence of the beloved. The five-bar interlude ponders the depth of these emotions; the tessitura of the piano writing goes deeper than anything so far, octaves between the hands are portentously introspective and add a note of turbulence: this passage allows us to hear how unhappy and lost the singer would be without his beloved companion. Perhaps they recall the restless person he had been without her, or perhaps they are saying ‘What have I done to deserve this luck?’ Schubert used the poem’s first line as his title, but Rückert later titled the poem Kehr ein bei mir (‘Stay with me’) which may imply that the poet envisaged this lyric as being a plea for reconciliation. Once again, the repetition of small musical cells is the secret behind the music’s strength. The interlude’s third bar is a repeat of the first; the fourth bar is reworking of the ‘Mein Aug’ und Herz’ melody, this time transposed into the tonic key. As has already been pointed out, the next musical verse (the third and fourth of Rückert’s strophes) is an almost exact repetition of the first. Schubert had conceived his music for the opening words, and the subsequent text does not fit quite as well. Here it is not a question of mood but of such practicalities as breath control: the enjambment of the meaning of ‘Und schliesse du’, ‘Still hinter dir’ and ‘Die Pforten zu’ offers quite a challenge to the singer’s technique. Ideally, this sentence should be sung without a breath: ‘closing … quietly behind you … the door’ needs no interruption as a single thought, although it is all but impossible to achieve this in a performance in this tempo. Otherwise there is only the slight change of inflection for the word ‘dies’ (a D instead of a C) in the phrase ‘Voll sei dies Herz’. The punctilious word-setter in Schubert cannot resist heightening the note by one degree as if to point out the singularity of this, the lover’s heart. We then have another chance to hear the interlude which has separated the two musical verses. What Schubert now has up sleeve is nothing short of miraculous. However beautiful the song has been up to this point, nothing prepares us for the revelations of the third musical verse. For one bar (for the four syllables of ‘Dies Augen …’) we might be fooled into thinking that we have a repeat of what has gone before in the first two verses, and the song would still have been famous. But everything changes on ‘Zelt’ (tent), part of the compound noun ‘Augenzelt’, Rückert’s newly minted oriental metaphor for a ‘tent of eyes’. In this temple-like enclosure the beloved’s gaze protects, cradles, enshrines, illuminates the life of the enraptured singer. The syllable ‘zelt’ moves to a C flat: in this way the key of E flat major cedes to a first inversion of C flat major. It is as if we have embarked on an excursion to the moon, our magic carpet irradiated by starlight. The vocal line rises in steady degrees up the stave, a journey of some peril for the singer where the poem’s heartfelt aspiration is built into the technical challenge. The sumptuous harmonic progression is through ever flatter keys—G flat major for ‘deinem’, the root position of C flat major for ‘Glanz’, and back to B flat major for ‘allein’. All through this passage, the piano writing is made ever more heartfelt by telling suspensions in the inner voices of the right-hand stave. This musical wonder is crowned by one of the composer’s most famous top notes. The word ‘erhellt’, thoroughly in keeping with the brightness of its meaning, is set to a high F (on B flat major) moving to a G (E flat7) where the note is a full dotted crotchet. Even this is not testing enough. There is another, even higher, dotted crotchet for the singer to cope with as the syllable ‘hellt’ slips up a semitone to an A flat. The quiet, introspective mood of the song is flooded with grandeur, as if by the light of religious revelation. A whole bar of silence is now called for—an unforgettable, somewhat eerie effect—and for ‘O füll’ es ganz’ we return to the music of blessing that has concluded each of the previous two verses, despite the fact that we are only half way through this one. We remember that Rückert has provided only five strophes, and Schubert needs six to complete his musical structure. No matter; he simply repeats the words of the fifth strophe to round off his third musical verse. But what a repetition, in this song of many repetitions! The words are the same as is the music (with the exception of a higher variant on ‘deinem’ in the third bar which Mandyczewski did not believe in but which has become accepted performing practice because it is in the ubiquitous Peters Edition) and the ascending scale is just as moving and majestic as before. But the second brave high A flat on the same word (‘erhellt’) is not so much famous as notorious. This is because the composer appears to ask for a diminuendo on it, in contrast to the continuing forte of the first time. But has he really? Schubert’s flamboyant way of writing an accent is uncomfortably similar to the hairpin sign for a diminuendo, and leaves open the question of whether or not this taxing change of colour high in the stave is really a requirement. 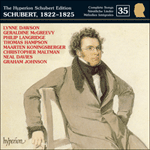 The Neue Schubert Ausgabe opts for a simple accent, the Gesamtausgabe marks both high notes in the same way, but so familiar is this diminuendo, fixed for more than a century in the Peters Edition, that most singers still attempt it. It is, in any case, a beautiful effect. After another bar’s silence the ‘blessing’ music returns for a fervent repetition of ‘O füll’ es ganz’. This time this music is enriched by beautiful echoes of the vocal line in the accompaniment, first high in the stave, and then, as the song comes to its peaceful end, an octave lower. The composer has seemed to save up this felicitous effect until the last moments, but at this level of inspiration he has no need to be thrifty with his ideas. In this song we have a boundless imagination constrained not by any poverty of invention, but by the fascinating challenge of making the most out of the least: the whole of this song seems to have sprung from a single seed. If 1823 was the year of the cycle (Die schöne Müllerin) the composer here shows himself master of organic recycling within a single song. be full of your joy.